Do you remember the fears of European countries that they were becoming too dependent upon imported natural gas from Russia? Those fears would spike every time there was a dispute that saw Russia shut off the gas to the non-paying miscreant. Imported natural gas from Libya helped to mitigate some fears until the recent turmoil in that country. While Eni says the gas near-term gas imports are not threatened, Europe still worries. Other supply options include long-running negotiations over natural gas pipeline construction to create alternatives to Russia, but progress is slow and the market potential for the pipelines uncertain. So it was insightful to read the European Energy Review report that the Dutch Energy Council had embraced the potential for unconventional natural gas production in the Netherlands and across Europe as a cost effective solution to Europe’s energy security problem. The Energy Council’s recommendations include policy changes to encourage unconventional E&P and, importantly, changes in the law that would allow landowners and tenants to receive royalties or other benefits from subsurface unconventional fuel production to reduce the NIMBY problems expected. The report says allowing unconventional natural gas production is consistent with Europe’s low-emissions goals since natural gas is substantially cleaner than the coal fired generation it would displace and much cheaper than carbon capture and sequestration given current technologies. One policy change, the Dutch Energy Council does NOT recommend is exempting unconventional natural gas production from water quality regulations. The US did so in its Energy policy Act of 2005, but the EU REACH legislation strictly regulates chemicals used in gas production. The Dutch Council called current environmental regulations “fully adequate to ensure that unconventional gas production can be carried out without adverse effects on the environment”. Another policy changed envisioned by expanding unconventional natural gas production would be to reduce or cap extraction from the Groningen (“Slochteren”) domestic gas field to extend its useful life by displacing that gas with unconventional supplies. The Netherlands currently exports natural gas to other EU countries from its huge Groningen field (“Slochteren”) in the northern part of the Netherlands. Unconventional gas development would preserve the Dutch export business while reserving its own resources for future use. Groningen proven reserves were estimated at 2,800 billion m3 of gas but exports and domestic use has reduced that reserve to 1,000 billion m3t. How big is Unconventional Gas in Europe? The European Commission and the International Energy Agency have said that total recoverable unconventional natural gas reserves in Europe are forecast to be between 33 to 38 trillion cubic metres (Tcm), with 12 Tcm of tight gas, 15 Tcm of shale gas and 8 Tcm of coalbed methane. That is enough natural gas to satisfy existing European demand for 60 years. Compare that to the BP Statistical Review of World Energy estimates of total proven EU conventional gas reserves of 2.42 Tcm. Based upon field analysis done to date Poland and the Baltic States appear to have some of the best E&P potential which is doubly good news for these countries so threatened by pressure from Russian for energy supply. 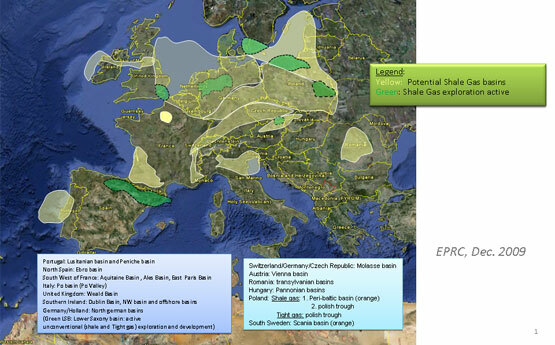 But the map done by Schlumberger suggests unconventional gas may be found in many places across Europe. The challenge will be gaining access to the technology and infrastructure to extract it profitably. This entry was posted in Competition, Environment and tagged Business, energy, Energy security, European Union, Horizontal Drilling, hydraulic fracturing, International Energy Agency, Netherlands, unconventional oil and gas, United States. Bookmark the permalink.